Ok, seriously.. this craft is so much fun! 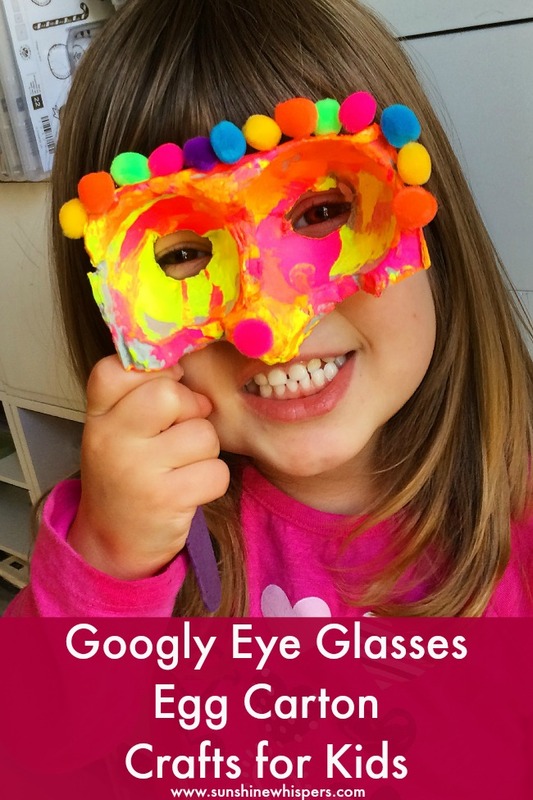 When Sweet Pea and I started making these bright glasses, I was just trying to make crafts for kids involving recycled materials. However, as the glasses were coming together I totally fell in love with them. 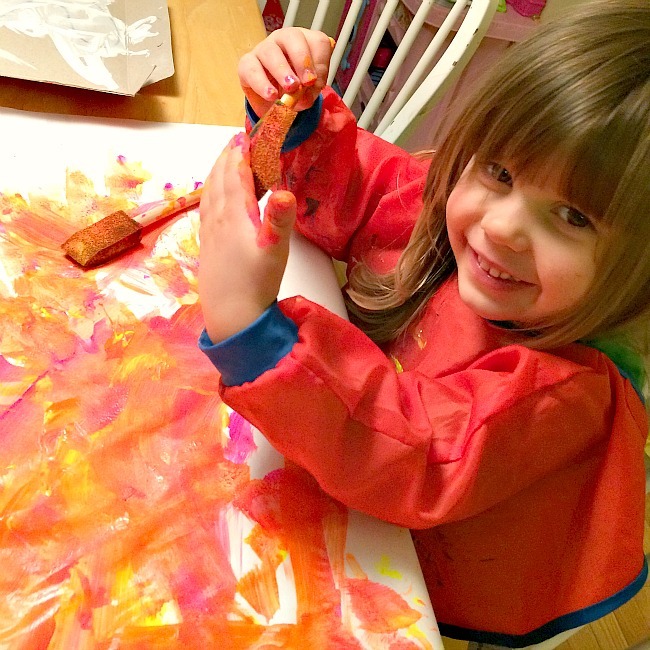 We use fluorescent paint colors and that made this craft totally pop! 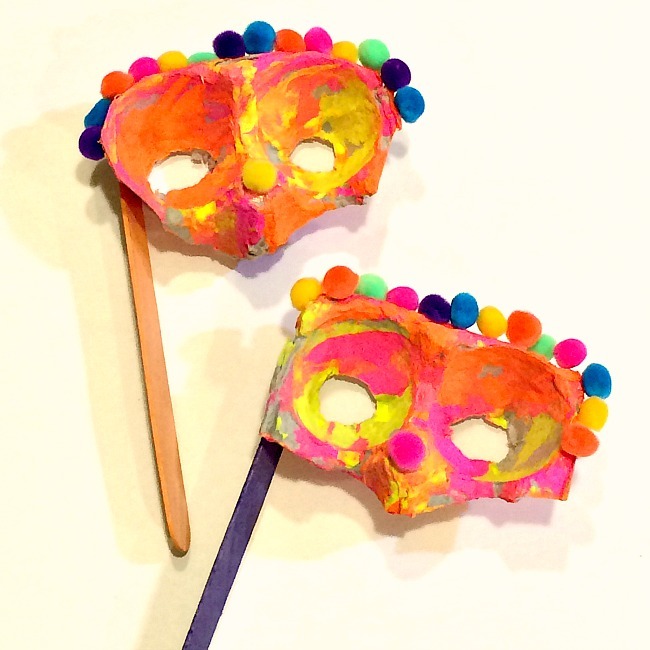 Plus, what a great DIY toy for pretend play.. or Mardi Gras/Carnival (although I can tell you that was the furthest thing from my mind when we made them). 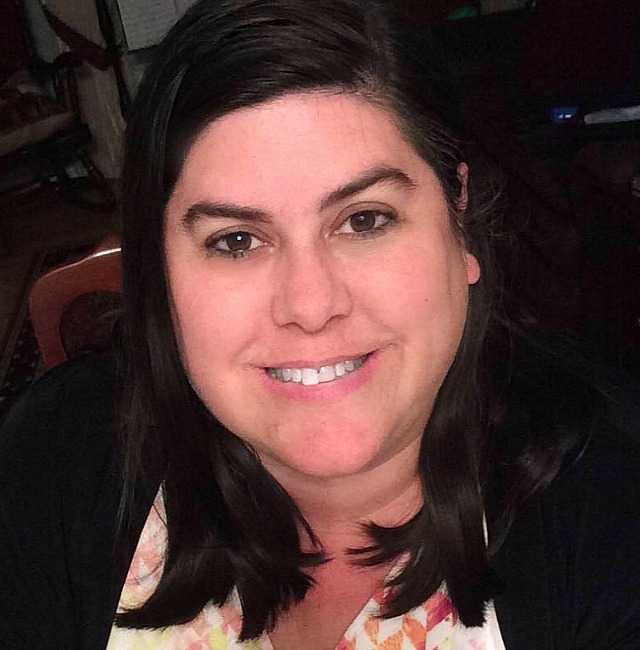 Read on to see how we made them! Egg carton. 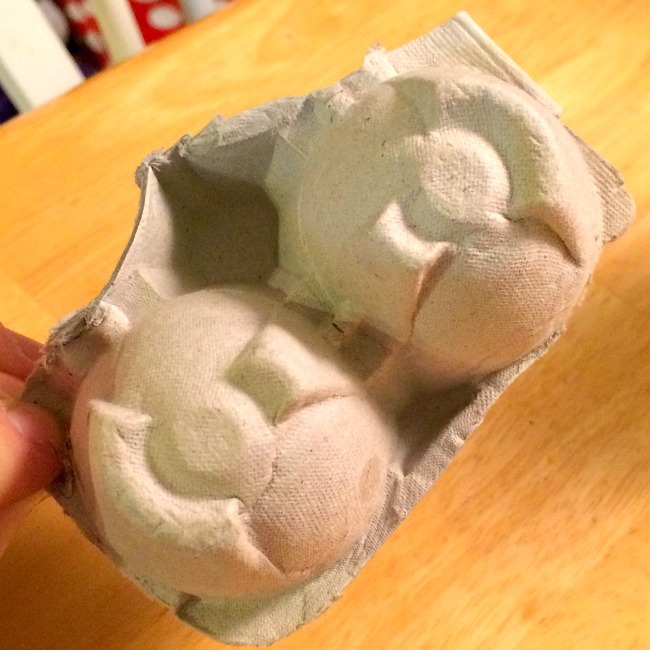 We used a cardboard one, but I imagine a Styrofoam egg carton would work too. 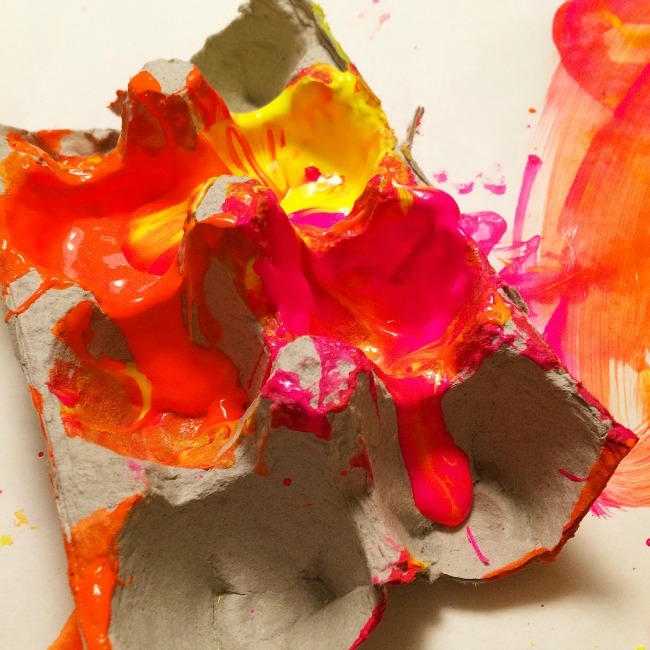 The colors would definitely pop more on the Styrofoam egg carton, but you might need to use acrylic paint instead of tempura paint. 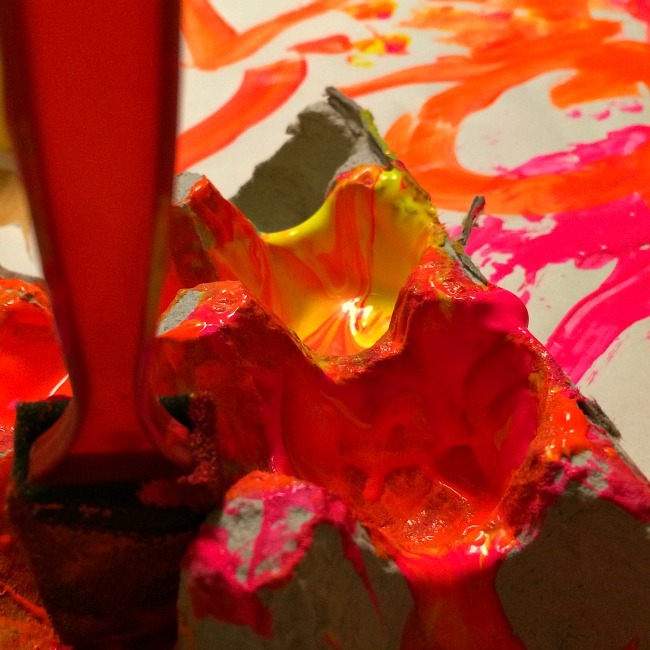 Tempura paint in fluorescent colors. We picked yellow, pink, and orange. 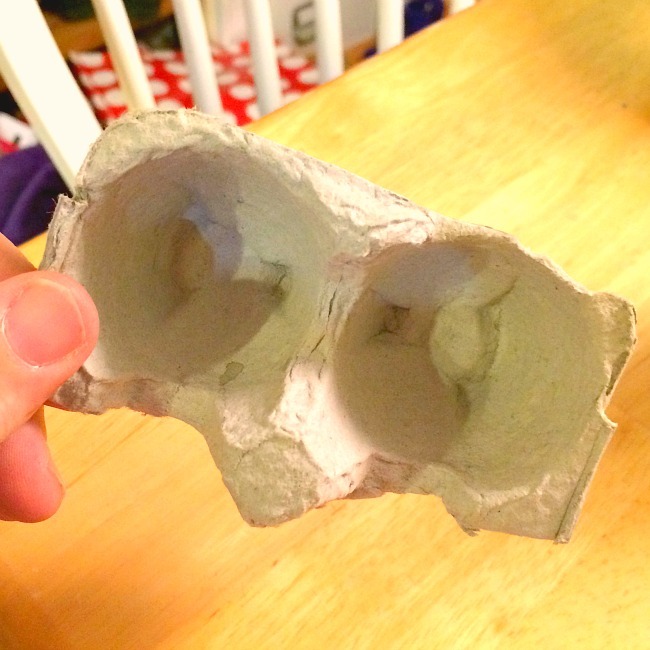 Cut the glasses out of the egg carton. When you cut the glasses out, you will cut below one row of ‘egg pods’ and around the part that sticks up. That will be the nose part of the glasses. You will also want to trim the carton so that you like the shape of the glasses. I cut out two sets of glasses, mostly because Sweet Pea always wants ‘Mommy to do it with me.’ How can I resist, right? 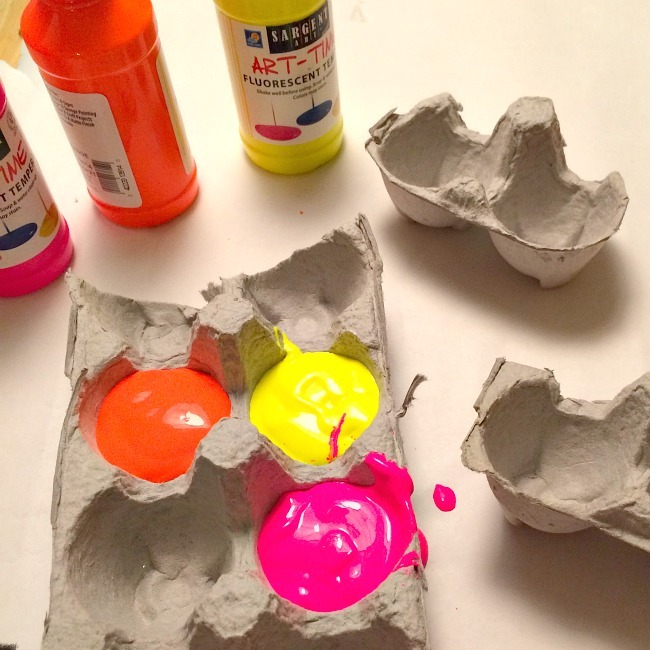 If you don’t feel like getting a paint container dirty, just use the rest of the egg carton to hold the paint! 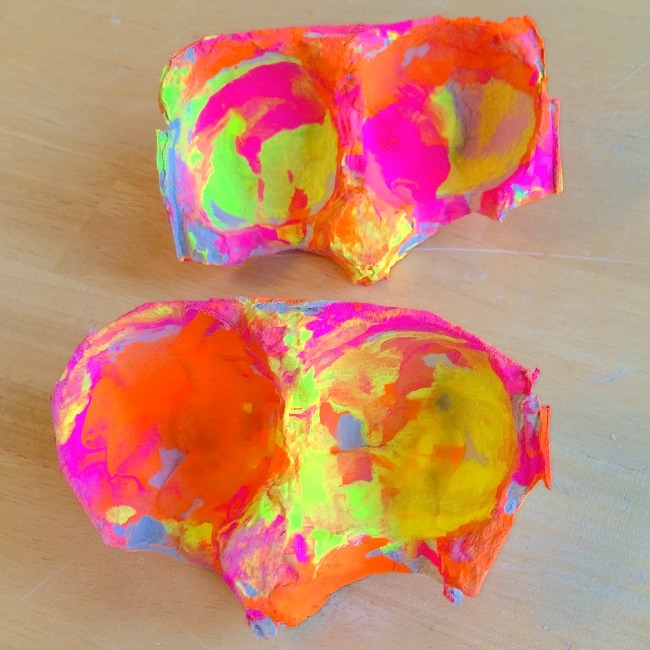 I just squirted one color in each pod, stuck a paint brush in it, and we were ready to go. The painting part is pretty easy. I mean, there is no right or wrong way to do it, as long as the entire egg carton glass is painted. I held the glasses for Sweet Pea so she could paint the insides, back, and bottom of the glasses. Additionally, I gently encouraged Sweet Pea to try all the colors, not just one. 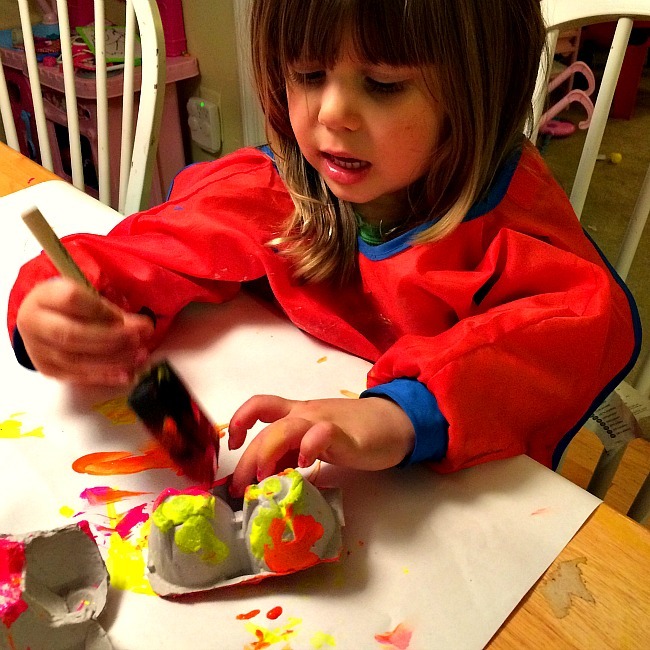 We had a blast painting the egg cartons. Can you tell? Ok, one more paint picture. I don’t know what it is about this paint.. but the colors make me happy. Once the paint has dried, use an exacto knife or sharp blade to cut out the bottom of each of the ‘egg pods.’ This will be where you look through the glasses/mask. 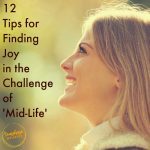 Note: this step should absolutely be done by a responsible adult. Apply a generous amount of glue to the top rim of the glasses. We actually applied glue halfway down each side of the glasses. Stick on the pompoms. 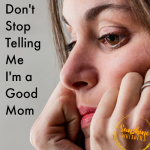 Again, there is no right or wrong way to do this. We created a pattern, but that is not really necessary. For extra flair, squeeze a dollop of glue on the nose and stick a pompom there as well. Apply a generous amount of glue to the top right hand side of the glasses. You might need to test out the angle to know exactly where to put the glue. You want to be able to hold the glasses so they are level. Also, we used pre-colored large craft sticks. 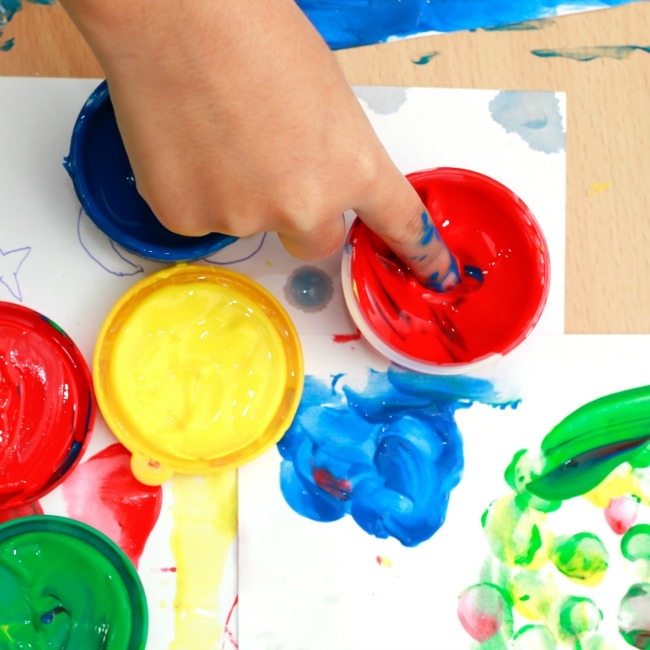 If you didn’t want to bother with pre-colored craft sticks, you could easily paint or color the craft sticks the desired color. Hold the craft stick in place long enough for the glue to set. 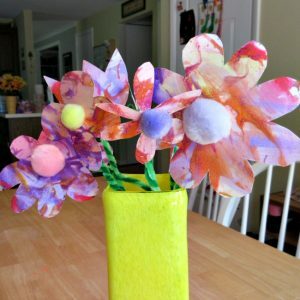 Let the craft stick handle and pompom rim dry. There you have it! 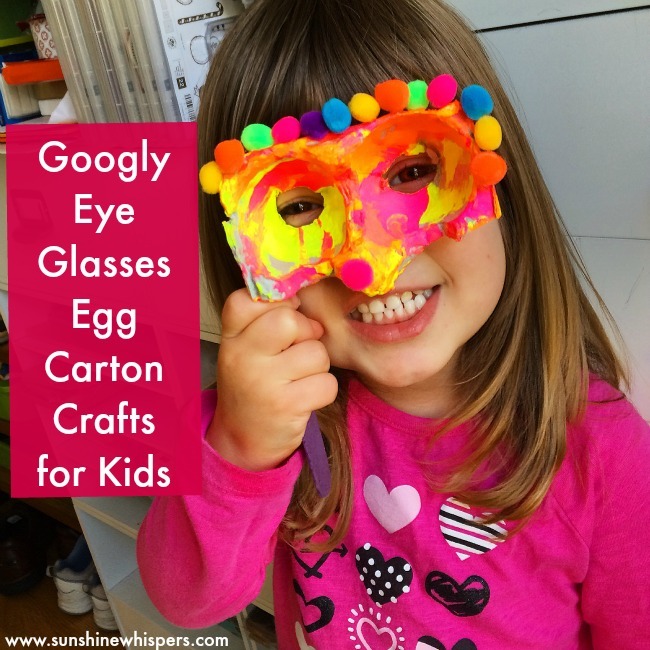 Googly Eye Glasses Egg Carton Crafts for Kids! Aren’t these glasses so much fun? 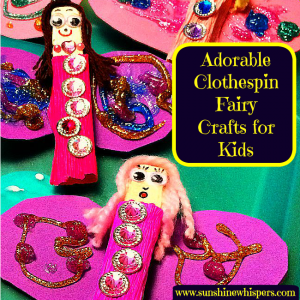 Would you like more super cute crafts for kids ideas? 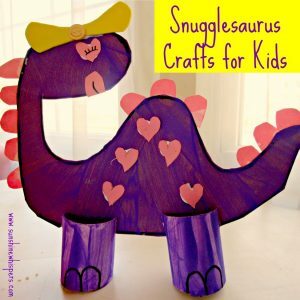 Check these ideas out and don’t forget to follow me on Pinterest to keep up to date on all the crafts Sweet Pea and I create!